We had our church potluck/picnic to attend on Saturday. I'd completely forgotten about it until Friday afternoon. Sometimes, that's just how it goes, right? We brainstormed Friday evening on what I could bring, that wouldn't entail a trip to the store. At that time, I was out of eggs, so baking seemed like a no-go. Then we talked about rhubarb crisp. But that just sounded too ordinary, but I was still keeping it on the back burner, just in case. Saturday morning, when out in the garden for a bit, I noticed that we had a lot of ripe blueberries. My daughters picked about 2 cups. I added about 2 cups of chopped rhubarb to the blueberries and made a rhubarb-blueberry crumble. It was evidently a hit, as when I had a shot at the dessert table, the baking dish was scraped clean. So, I thought you may also be interested in this recipe, as it was a good way to stretch the blueberry flavor, and the orange zest was a nice addition to the blueberry and rhubarb flavors. Preheat oven to 375 degrees F (190 C). Butter an 8 X 8 inch baking dish. In a medium bowl, stir together flour, sugars, salt and orange zest. 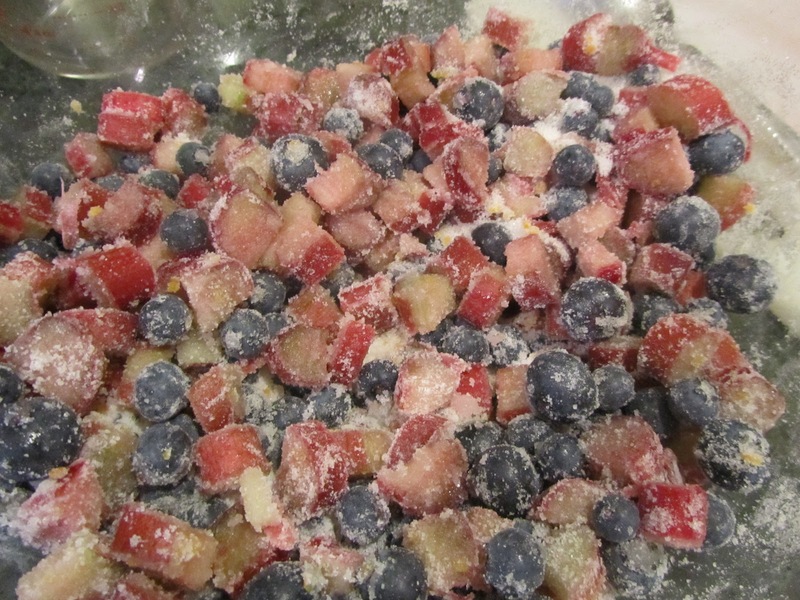 Toss with berries and rhubarb. Drizzle the water over all. Scoop into the prepared baking dish. Combine all ingredients until crumbly. Sprinkle over filling. Bake for 35 minutes, or until topping is golden. Mixed fruit crisps and cobblers are the best! Yum! Totally agree! And this time of summer I like camouflaging the rhubarb a bit, as we've been eating it for months. Oh my goodness this looks so delicious! I agree I really love mixed fruit cobblers and crisps. I've promised my disappointed family members that I'd bake another one this weekend. Another combo I love is peach and blueberry. That's what I was going to say. Blueberry and Peach. 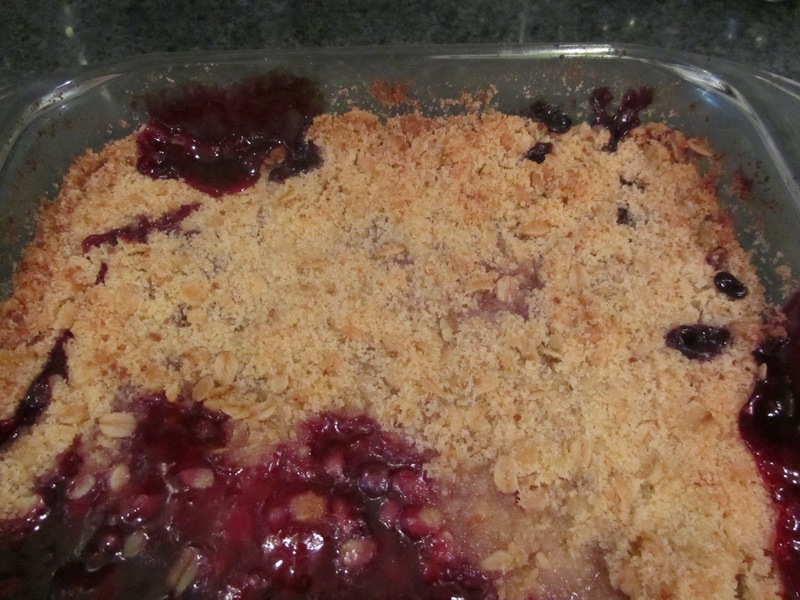 When blueberries were ripe here, I made a peach and blueberry crisp that was especially good. I'm wishing I could have some for breakfast right now! Do you ever have pie for breakfast? When I was younger I read Farmer Boy (Little House series), and Almanzo got to have pie for breakfast. I could not convince my mom that pie would be an appropriate breakfast food. But I also think crumbles and cobblers would make great breakfast food.